It’s one of the hottest destinations in Central America. With beaches, rainforest, sulphur-spitting volcanos, luxury eco resorts and plenty of wildlife, Nicaragua is now firmly on the tourist map. Thinking of going? Here are some top eco resorts in Nicaragua to check out. “Is it safe?” people asked when I said I was going to Nicaragua. “I guess I’ll find out,” I said. According to what I’ve read Nicaragua is now the safest country in Central America. But here I am on a dirt road in the jungle and I’m frightened. 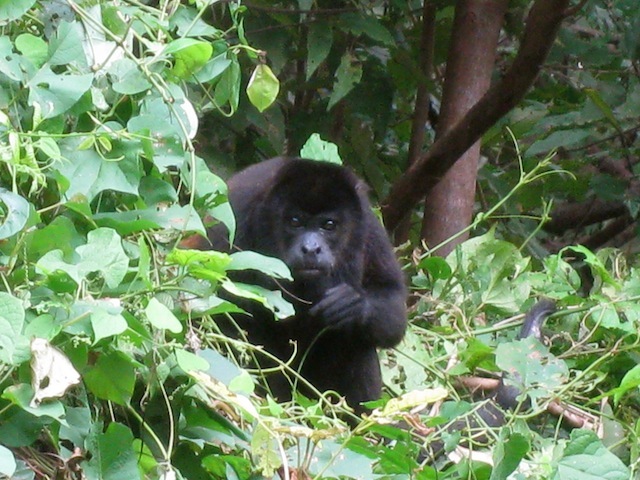 Not of violence and civil strife – I’m worried a howler monkey is going to drop poop bombs on my head. Howler monkeys, three-toed sloths, jaguars and armadillos … these are just some of the exotic animals that make Nicaragua their home, which is one of the reasons this country has become such a top eco destination. Biologically diverse, it has nearly 8 million acres of primal forest (though it’s losing about 1% every year due to deforestation). With some 1400 animal species and more than 12,000 types of plants, it’s easy to see why it holds a powerful allure for nature seekers. But right now I have more pressing things hanging over my head. “Would they really do it?” I asked Juan, the guide for our small group. “They might if they feel threatened,” he said. It’s a defensive attack that makes sense. It’s certainly made me ready to run. A weird harsh howl burst out of the tress, leaves shook and that howler monkey shot I was so desperate to get no longer seems vital. I raced back to our van and we were quickly heading to Morgan’s Rock Hacienda & Ecolodge, a top eco lodge in Nicaragua, a country that takes its sustainability seriously and proves that luxury accommodation and caring about the environment aren’t mutually exclusive. Sitting pretty on Nicaragua’s southwest coast, Morgan’s Rock Eco Lodge is only 18 kilometres from the lively surfing centre, San Juan del Sur, This well-established resort was the first luxury eco lodge in Nicaragua. New upscale hotels and resorts are moving in, however, as the country has become a prime destination for green travellers. Step back from the rim! Still with plenty of unspoiled regions, with coastline on both the Pacific and the Caribbean, Nicaragua has a wide range of landscape. It’s a land of simmering volcanoes, tangled rainforests and a scattering of lodges-with-a-conscience that blend jet-setter chic with sustainability. It’s still not a well-oiled tourist machine and at some point you’ll likely find yourself on a jarring dirt road, but you’ll also find a warm optimistic vibe and a country teetering between discovery and grit. Award-winning Morgan’s Rock Eco Lodge is set on a 4,000-acre private protected reserve. There is a secluded beach, nesting sea turtles, jungle and only 15 deluxe bungalows constructed from exotic local woods. Throw in an outdoor pool, a working farm (your chance to milk a cow!) and it’s clear why it remains a perennial favourite with eco travellers seeking escape. 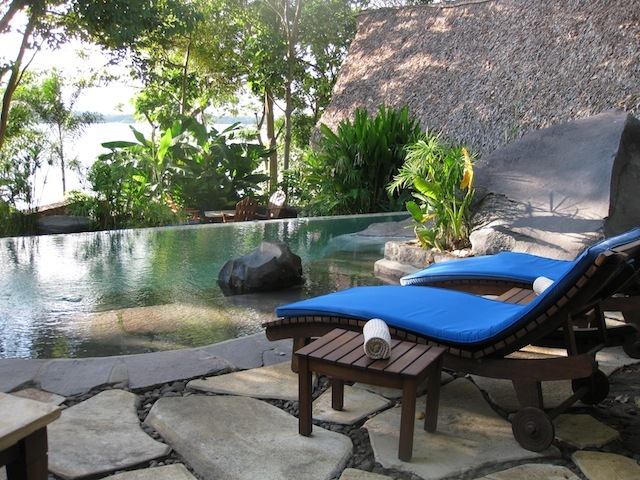 Another top luxury eco resort in Nicaragua is Aqua Wellness Resort. Located not too far from Morgan’s Rock, near the fishing village of Gigante, Aqua is only property on crescent-shaped Redonda Bay. The resort’s 24 treetop villas are spread out over the hillside so be forewarned, you’ll do a lot of walking, but it’s all part of the get fit process. Aqua Wellness Resort is known for its yoga retreats and has a holistic-minded spa. With plunge pools, paths lined with lava rock and villas surrounded by wild ginger and banana trees, it’s a jungle getaway worth the trek. Down at Rodonda Beach, the setting sun spilled honey-tinted light onto the boulders at the edge of the shore. After splashing around in the sheltered bay, I made my way to the beachside restaurant to meet Aqua’s Canadian co-owner, Trevor Barran. 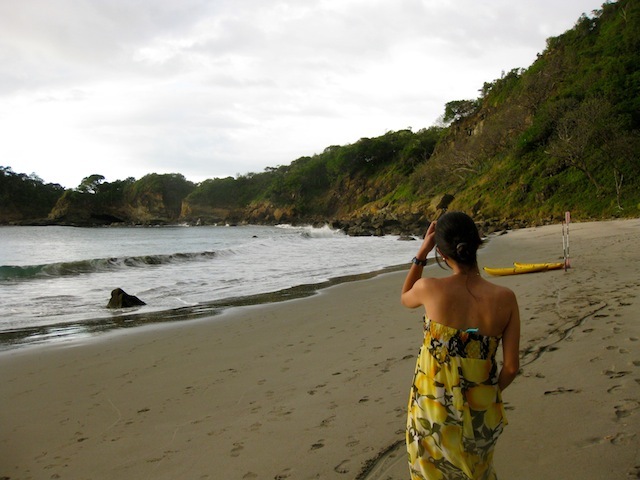 I would have liked to stay at Rendonda Bay and soak up the vibe, but there were other eco resorts in Nicaragua to check out. 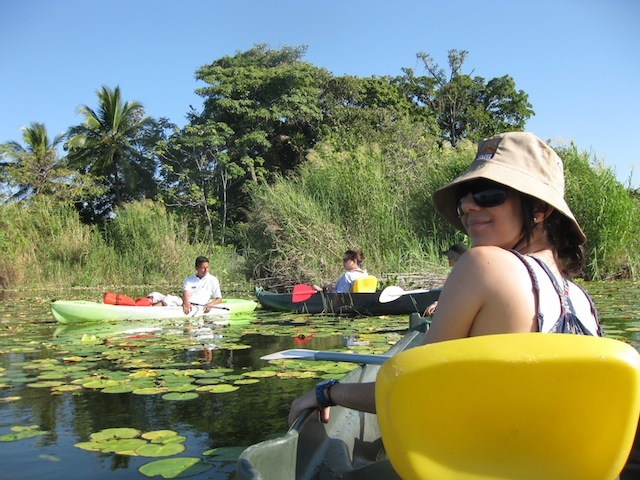 Jicaro Island Ecolodge lies further north near Granada, a colonial town on the shores of Lake Nicaragua. 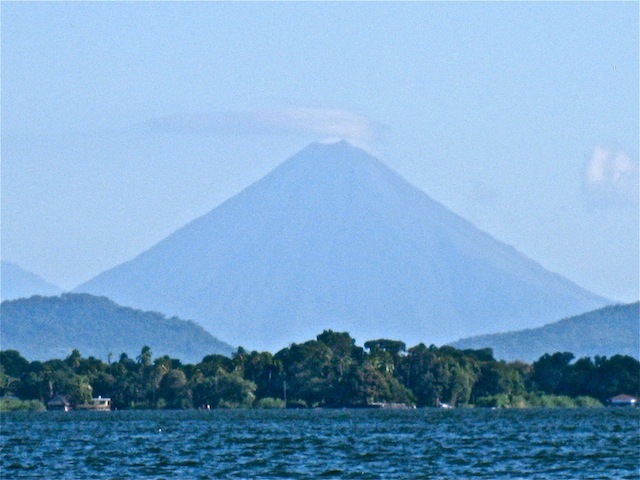 Centuries ago, when Mombacho Volcano erupted, enough rock flew through the air to create Las Isletas, a group of 365 islands sprinkled over Central America’s largest lake. Some of these tiny islands hold nothing more than a tree and a few cormorants. Others house the mansions of the elite. And one is owned by Karen Emanuel, a British woman who opened Jicaro Island Ecolodge in 2010. Picture a porcupine but instead of quills, imagine ferns, ceiba trees and birds of paradise bursting out of the ground. Add in nine casitas (villas constructed from reclaimed wood), a yoga deck, a lookout tower, an open-air restaurant, an infinity pool and a lakeside spa pavilion and you have Jicaro Island Ecolodge. 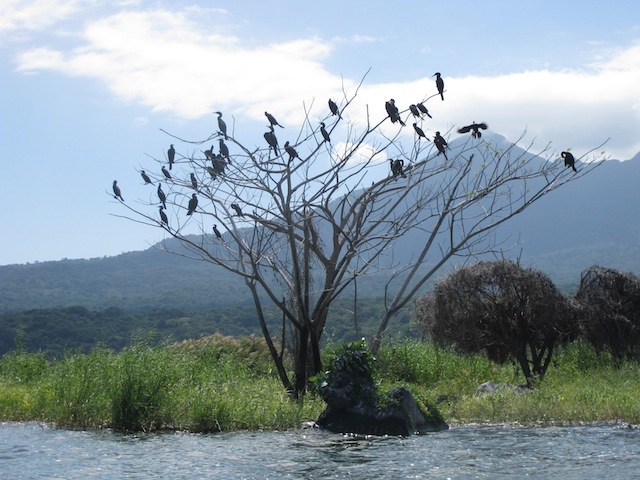 There is no beach at Jicaro Lodge, but you can swim in Lake Nicaragua. In the early morning I kayaked through lily pads while egrets and herons flapped overhead. It felt remote and tranquil — and hard to believe I was just a 20-minute boat ride from lively Granada with its candy-coloured shops, spacious plazas and neoclassical cathedral. Darkness hits swiftly on Jicaro island. After a twilight massage and a dinner of fresh grilled fish at Jicaro’s restaurant, I padded down the path to my casita. Inside, something was wrong. Either this wasn’t my room or someone snuck in and neatly unpacked my suitcase. Embarrassed, I backtracked and found the right casita. 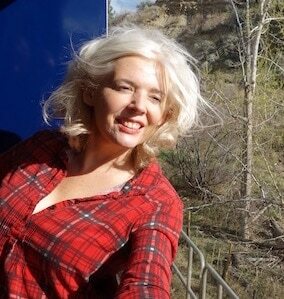 I was in my nightgown when the door slid open and an American woman walked in. She waved goodbye and I thought back to when I’d arrived, wondering if the country was safe. Here I was such a short time later, so comfortable I’d forgotten to lock my door. As long as a howler monkey leap walk in, I should be good to go. Getting to Nicaragua: From the capital city of Managua private transfers to the lodges can be arranged through the hotels. San Juan del Sur is a laid back beachy town with plenty of surfers. Pelican Eyes Resort rel=”nofollow” has pools, gardens, curved white walls and was home base for the production crew during Survivor Nicaragua. The colonial city of Granada is one of Nicaragua’s top destinations. For something atmospheric, relax amidst the old world architecture of Hotel Dario on Calle La Calzada. Things to do in Granada Feast on grilled steak at El Zaguan restaurant on Calle El Arsenal. Outdoor adventure in Nicaragua: Zip line over a coffee plantation on the slope of Mombacho Volcano. Drive right up to a simmering volcano at Masaya Volcano National Park. Oro Travel can arrange various tours and activities. SAFETY: Nicaragua is a friendly country but use common sense. There are always risks when travelling in a foreign country. Don’t walk alone at night. Don’t flash your valuables and keep an eye on your bags. Drink filtered water, use mosquito repellent and buy travel insurance. And don’t do what I did and forget to lock your door! This post contains affiliate links. If you do book a hotel through this site I’ll get a small commission, which helps me maintain this travel blog. But don’t worry, it’s at no cost to you. Hi Chantel, Thanks for reading the Nicaragua article. I think that you would need to contact each resort you’re considering, and ask them for the best room for you and what your best options for accommodation are. I do remember that they were all fairly spread out. 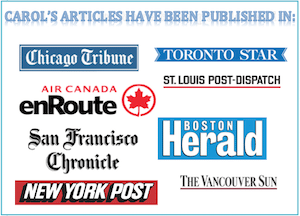 Hi Carol, I loved your article it was very helpful. My new husband and I are looking at the Eco resorts in Nicaragua for a romantic anniversary trip. I love the peaceful/wellness type atmosphere, but he struggles with a lot of steps, which do you recommend? Hi Alicia, I hope you have a terrific trip. It’s an amazing country. I would recommend all of the hotels mentioned in my article, but since I never stayed at a private home I can’t compare. I met a ton of Canadian and Americans that had made Nicaragua their home though, and they all seemed passionate about the country. In general, I’d opt for resort areas – whether it’s in a home or hotel that you stay in. And please let me know how the trip goes.